Now you have two ways to express whatever the heck is going on with you. Just as Kanye West sells his fine collection of high end shoes (shoes that he’s absurdly sensitive about to boot) so too does Post Malone have a deal with a fine footwear outlet. In this case less high end sneakers, and more soy bean slippers. That’s right. Post Malone dropped his second collab with Crocs. At long last. People with bad taste have two ways to express whatever the hell it is they’re about. In any case, the rapper has represented the tacky aughts super slipper long before the collaboration began, wearing them during performances, and doing his best to make the concept of this disgusting soy bean shoe cool again. His love for the croc came into full force when he collaborated with the footwear and released the first Post Malone inspired shoe on November 1st, 2018. Well, those crocs sold out ten minutes. Cool. And the new pair beat that record by selling out in ten seconds. Cool. Cool. Cool. Cool. All of you are weird. 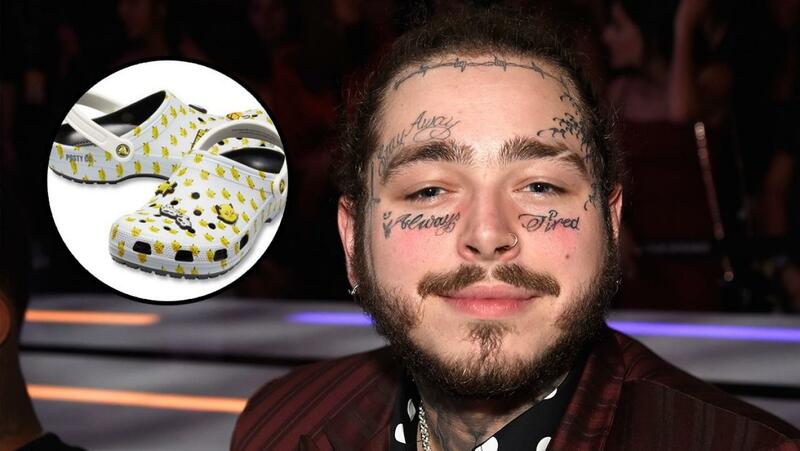 The “Dimitry Clog”, Post Malone’s footwear of choice, was originally $59.99, but is now being sold online for up to $800. That’s right. For one month’s rent (I live in Los Angeles. Apparently it’s lower everywhere else) you can buy a big foam shoe that a celebrity said is based on him. Meanwhile, here I am waiting for an Eminem themed Vans pair, and do I get it? Folks, sadly I do not! What do you guys think of the Post Malone Crocs? Are Crocs actually cool, or is everyone trying too hard to be ironic? And Post Malone? Is he being post… modern? Look, these are all excellent questions, and I’m sure you absolutely have the answers to them. Let us know in the comments, or let us know on Twitter at @WhatsTrending.